Converting the former Arnold’s Stationery building into artist residences is a critical component in city plans to make downtown a place where more people live and businesses flourish, said Economic Development and Industrial Corporation Executive Director James M. Cowdell. Eight artists will own residences in 33 Central Square by November, and commercial space, possibly a gallery, will occupy its ground floor, Cowdell said Thursday. “It will be something that ties into the arts,” he said. EDIC has worked since 2013 to give the building a new lease on life, and renovation work is nearing its final stage. “It was condemned and in complete disrepair and in an area we wanted to redevelop,” Cowdell said. The agency committed $1.7 million in financing to the renovation project and Neighborhood Development Associates, Inc. — a partner organization of Lynn Housing Authority and Neighborhood Development — oversaw the reconstruction working with Georgetown-based builder Caruso McGovern. After stabilizing the sagging roof, workers gutted and converted the building’s interior into living units that include space for artists to work. 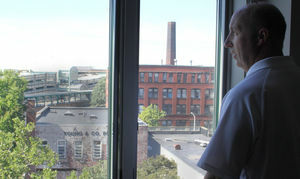 The residences’ big windows offer sweeping views of Lynn. LHAND/NDA Planning and Development Director Peggy Phelps said four of the units will be reserved for buyers who meet income qualifications making them eligible to receive a subsidy worth up to $25,000. “It reduces the cost of the mortgage,” Phelps said. She said the units will be priced between $125,000 and $167,000 and marketed through Annmarie Jonah Realtors. An “artist certification group” made up of representatives from local art institutions will certify prospective buyers and pass on purchasing candidates to NDA. Being an artist is a critical qualification for purchasing a residence. Cowdell said the Arnold building’s rebirth is in line with objectives staked out in a 2004 study that concluded 500 downtown residents could trigger significant economic revitalization in the area. About 250 people live downtown now, and city planners see the former Lincoln Bank building, 23 Central Ave., and 38 Exchange St. as prospective locations for future area residents. “Bringing people downtown has been one of our goals. There is a direct correlation between disposable income and downtown restaurants,” Cowdell said.